Air pollution is the world’s fourth-leading fatal health risk and the top environmental health risk. One in nine deaths globally are attributed to ambient air pollution, with poor people being disproportionately affected. More than 90 percent of these deaths occur in Asia and Africa. The climate impact is also significant: “super pollutants” (usually includes black carbon, methane, hydroflourocarbons and tropospheric ozone) are responsible for nearly half of the Earth’s accumulated warming to date. They also affect crop yields, solar energy generation, and some aspects of rainfall patterns and storm intensity. Cities are pollution hotspots and residents are calling for rapid action for cleaner air. Local governments need to invest in addressing air pollution through clean power generation and fuel switching, industrial efficiency and controls, transport upgrades and modal shifts, and, in certain areas, agricultural improvements. Innovative financial solutions are needed to enable cities to access the funding required for these investments. Instruments such as the proposed “Breathe Better Bond” being developed by IFC can incentivize cities to borrow specifically to address air pollution, as the instrument incorporates results-based incentives such as lower interest rates for meeting agreed performance milestones. While many of the policy levers and investment decisions required for clean air are beyond cities’ reach, because borrowing conditions are often set at a national level, their consumption choices, positive examples and political voices matter. 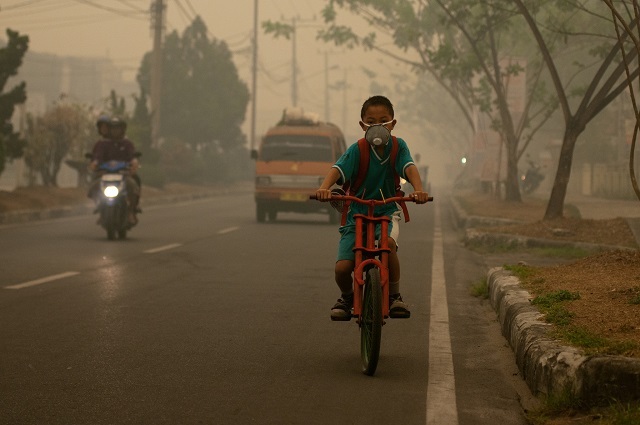 Cleaning up the air ultimately requires public discourse based on scientific evidence, and integrated action across sectors and administrative geographies. It also requires political stamina and neighbors to follow suit. The high cost of controlling or eliminating emissions often falls on particular industries or individuals, but the benefits of cleaner air are felt by all of us. Much of cities’ attention has been on reducing local emission sources: fossil-fuel transport, solid waste burning, high-emitting household energy sources such as coal or biomass, and control of volatile organic compounds. Reducing household emissions is often a matter of prioritizing energy access programs – households typically prefer electricity, gas and other locally less-polluting forms of energy when they can afford it. Solid waste burning is more challenging, since it requires not only having a comprehensive and functional system for collective solid waste, but also attention to landfill management in order to avoid spontaneous combustion. Solid waste burning is an intermittent pollution source, making it hard to build sustained action for reducing it. The 2016 fire in Mumbai’s Deonar dumpsite, for example, blanketed much of the city in toxic smog and provoked a media frenzy, but as the smog dissipated, so too did attention on the issue. Passenger and freight vehicles are often among the largest contributors to urban air pollution. Strategies for comprehensive control have three prongs: avoid the need for transport by optimizing land use; shift to lower-emitting modes; and improve the cleanliness of vehicles through cleaner fuels and tighter emission standards. Cities are increasingly looking at traffic management interventions, such as congestion charging, vehicle restriction, and low-emission or clean air zones as options to address urban air pollution. São Paulo, for example, adopted “car-free Fridays,” restricting personal vehicles from entering the downtown area on the last Friday of every month and encouraging cleaner modes of transport instead. The World Resources Institute is tracking effects locally with the city’s secretary of mobility through an air quality monitoring project. While drivers may protest, traffic management measures are politically popular. In China, WRI’s feasibility assessment of a low-emission zone found public opinion to be evenly split on the proposal, even before implementation. The demonstrable impact often wins more support: In Stockholm, for example, only 34 percent of the residents initially supported congestion charging and low-emission zone initiatives, but that percentage increased to 72 percent six years after implementation. Low-emission zones can also drive broader fleet changes if strategically placed in high vehicle pass-through areas such as ports or high-density business districts. Most cities cannot achieve clean air without addressing the emission sources around them. Sometimes the flows are visible – smoke from crop burning can easily be seen from space. Other times they are subtler. Gaseous ammonia emitted from manure and excess synthetic fertilizer use can combine with vehicle, power plant and industrial emissions to form micro particulate pollution (PM2.5) that travels downwind easily. Cities need to collaborate with higher levels of government on policies, regulations and approaches to reducing emissions within their boundaries, as fuel quality standards are typically set by national policy. Urban infrastructure investments, which form the foundation for shifting people to low-emitting public transport, are typically financed by national and international sources. Strategies to consider include multi-city airshed coalitions emerging as a voice in state and national policies, creative institutional design in which cities invest in emission reductions in surrounding areas as a cost-effective way to clean up their territory’s air, and cities starting to use their power as consumers to demand lower-pollution supply chains.